Our club is 110 members strong, working together to offer community service here at home and throughout the world! Dublin AM meets at 7:30 AM every Friday morning at The Country Club at Muirfield Village. Visitors are welcome to join us to meet business and community leaders, hear presentations from a some of the areas most interesting speakers and learn more about Rotary International. Pro Am day ticket registration – please see Mike Isler’s message and forward the Pro AM event to your friends and colleagues! Don’t forget to register yourself and a guest on the Club runner link -Thanks Claudia! The Pro Am committee was pushed back a week since we do not have a meeting on Friday. Please meet Friday 4/26 at 7 am – TCC as usual before the meeting. Sad news about Fay’s family and the loss of her brother- please keep them in our prayers this week. 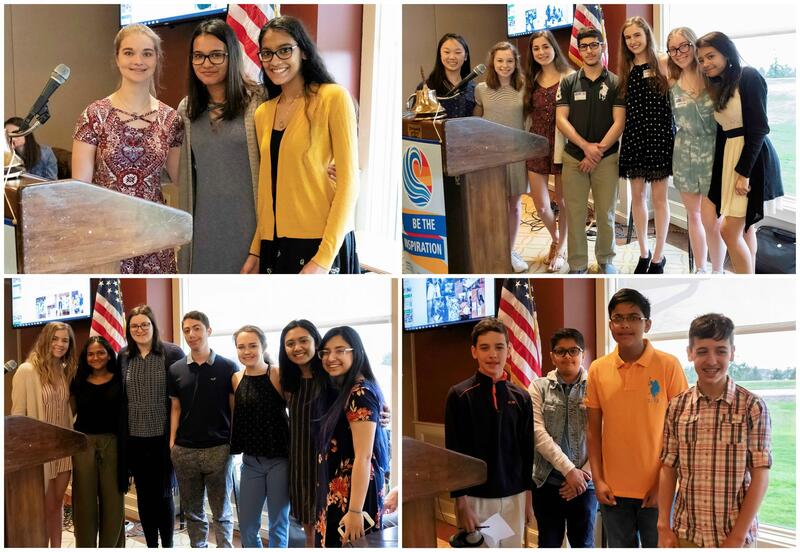 Dalma announced that the exchange student Fundraiser Dinner Saturday evening was very successful in raising funds for the Polio Fight and thanks everyone for their generosity and St. Patrick’s for hosting. Rev. Steve Smith encourages Fish Fry Friday at St. Pat’s as the proceeds are going to Habitat for Humanity this week. Lou shared the progress with the City for a car show September 1st. Much more to follow over the coming months. Paige shared the growth of the Dublin Schools, positive news and names for these additions to the School District. Recognition of Calvin Gebhart and the Gold sponsorship for the Pro Am Day contributed by First Citizens National Bank . Mike and Ingrid shared the details on Pro Am day tickets and the Clubrunner registration process and the day's schedule to relax and enjoy the social setting with good food and beverages in a private hospitality house and The Memorial at Muirfield. Dublin Food Pantry volunteers are needed and Dave sent a sign up sheet around at the meeting. Volunteers work the first Monday of every month. Please reach out to David Lundregan to schedule yourself. Our exchange student, Chris Humphrey, is going to France in August and expressed his appreciation to our club. He also shared the event that Dalma shared: a Youth fundraiser happening April 6th at St. Patrick’s that will raise money to fight Polio through Rotary. Please save the date and look at https://rotary6690.org/training-events/calendar/ for more details. Sue Burness introduced today’s speaker and colleague at the City of Dublin, Donna Goss, Ph.D. Director of Development. Our guests today were Dr. Shannon Ho, Internal Fetal Medicine Specialist and Sherry Valentine, Director of Womens Health, from Dublin Methodist Hospital. Page Vornbrook introduced our guests and explained that the growth in the hospital since it opened 10 years ago has far exceeded expectations. Last year, 2,800 babies were born at Dublin Methodist, and over 14,000 babies have been born there overall. It's projected that in the coming years, more than 4,000 babies will be born each year! A 30,000 square foot addition is underway at the hospital to address the expanded requirements. As part of this expansion, a Womens Health Center is being opened. Our own Bonnie Coley-Malir is chairing the committee that is raising awareness/funding for this center. The new center will offer outpatient services for women. Dr. Ho explained to us that pregnancy can create long-term risks to the health of the mother, leading to cardiovascular, diabetes and other long-term risks. Ryan Blackburn, Regional Workforce Consultant for the Ohio Department of Veteran Services. Ryan Blackburn, Regional Workforce Consultant for the Ohio Department of Veteran Services speaking to Dublin AM Rotary. Ryan Keenan getting his red "New Member" badge taken off. Abbreviated Meeting Due to Weather – Good Announcements! Jim Bandeen is representing our Polar Bear Fundraising team and Dublin AM Rotary in an interview with Karina Nova at 6:50 AM on Channel 10 tomorrow Saturday February 2nd. Grab a warm cup of coffee and tune in early to watch and support Jim in his first live TV appearance for our club. Kent Underwood thank everyone for completing the surveys and to the folks that came out last night to participate in the visioning exercise. Some great ideas came out and great support for our Dublin AM Rotary Club. Look for more output over the next several weeks and months. Progressive dinner - February 23th 2019 is the date. Sharon Kendall shared news about the 2019 New Generations Service Exchange. This is a unique vocational exchange happening with Romania May 28th till June 17th. Sharon shared that the eligible participants will be business professionals from 25 to 45. For more information please text Sharon at 614- 286-0989. The Rev. Stephen Smith shared the religious significance of February 2nd and shared a description of the winter days and CandleMas celebrating Jesus as a 6 week old baby boy being presented at Temple. From CandleMas and the long winter shadows we have the origins of Groundhogs Day. Wikipedia has quite the reference to Candlemas and the I am sure Rev. Stephen can share more about the Presentation of Jesus and the ritual purification of Mary for interested members. Here's the big news: Susan Robenalt won the big pot! See, it really does pay to come to our Friday morning meetings! The Polar Bear Golf Open will be held Sat., Feb. 9. If you have not registered yet, go to www.polarbeargolf.org and do it today! Sinan Yaykin shared that we will be hosting an inbound exchange student in the next school year. We are also sponsoring 1 long-term outbound student and 4 short-term inbound students. That's putting the International in RI! Tod Beckett announced that Classic Limousine will be a Pro-Am sponsor and will offer free transportation for the veterans who will be our guests that day. Stay tuned for more details about the Pro-Am. Kent Underwood asked that all members complete the Club Vision survey he sent out previously. It takes only a couple of minutes...you can do it. Mr. Timm, a fellow Rotarian from the Rotary Club of Gahanna, helps bring sporting events of all types to Columbus. Founded in 2002, the Greater Columbus Sports Commission is a key player in driving the economy in Central Ohio. Nate discussed the 4 Factors driving Economic Development across the country and in our community; Automation/Artificial Intelligence, Re-urbanization, Age of energy and the Skilled Labor Crisis. The driving force is technology and the impact the internet has made across all industries and in all communities. The Bridge Park project was a great example of Dublin city proactively putting a plan in place to attract individuals that may have chosen to move into urban centers vs. the suburbs. We now live in a country where we are becoming more and more independent for our energy sources. We have more and more sources for oil and Natural Gas which has played a major role in reducing our dependency of other countries for energy sources. This crisis is being felt multiple industries; construction, electrical, and even in IT we are seeing a shortage in skilled workers. This is being driven by low unemployment and in addition it is impacted by the opioid crisis. There is a strong need to get more students engaged earlier, specifically in technical and trade schools. Roberta Kayne- New Calendars are now available-all proceeds benefit Rotary. Calendars can be purchased online at LULU.com and by searching Roberta Kayne, or you can also place an order directly with Roberta. Wreaths across America is taking orders for their annual Christmas Wreath Program. What does it mean to sponsor a veteran’s wreath? It means you’ll honor an American hero at one of more than 1,400 locations nationwide this year on Wreaths Across America Day. It’s a day that’s been set aside to lay wreaths at the places where we remember, honor and teach about our veterans. Go to www.wreathsacrossamerica.org to donate a wreath for this year’s event. The annual Bell Ringing for the Salvation Army is coming up at the Bridge Street and Perimeter Kroger stores – Please see Bruce Andrews to sign-up for this great cause. Saturday, November 17th – "Friends-giving” Perfect Party at Peter and Betsy Georgiton’s home. Please bring a non-perishable item that can be served at Thanksgiving to donate to the Dublin Food Pantry. Thursday, November 29th, 5 - 7 pm – Holiday Tree Lighting celebration in Coffman Park. We will meet at the big white barn for this annual family event. Kaitlyn Gushue is organizing a cider and hot chocolate sale at the barn with proceeds going to the Dublin Historical Society. Friday, December 7th – Annual Dublin AM Holiday Party at the Country Club at Muirfield Village. Invitations going out to members this weekend. Bruce Anderson passed the Bell Ringing schedule clipboard and our Kroger’s duty slots were filled with promises of training to come for our Bell Buddies. 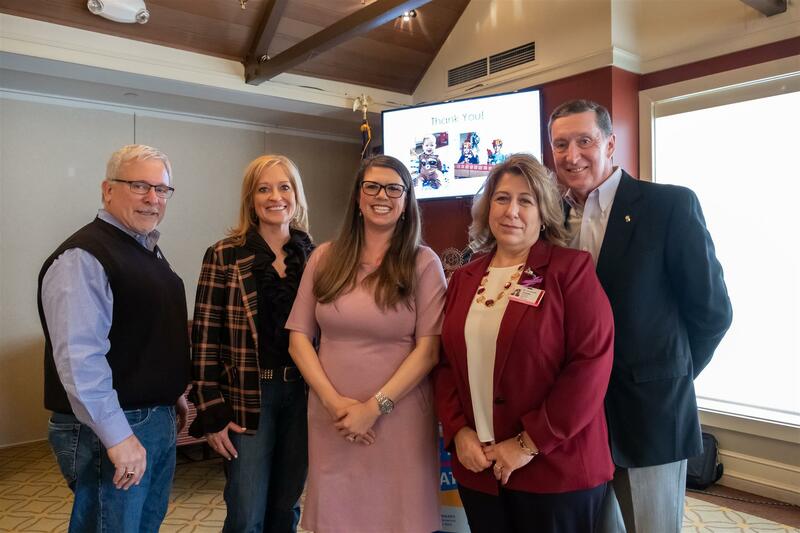 Kent did the New Member honors and Ingrid Fields appreciates being a full member in this Rotary Club and the terrific members. Cindy and Dwight shared a somber moment discussing the tragic death of a vivacious lady and past Rotary president in the Worthington Dublin Club and a dear neighbor, BJ Stone. Over $2,000 was raised for Rotary International’s Polio fund. Dwight mentioned Wreaths Across America will be discussed in upcoming meetings. Al Burzynski shared the mission of the First National Veteran’s Memorial and Museum as sharing the veteran’s journey, creating multi-purpose space for groups and families to use and a quiet place in Memorial Grove for reflection and celebration. From the pictures Al shared of the impressive and unique building and setting on 7 acres along the Scioto River, one can easily see the appeal of visiting and spending time reviewing all the wars that our military has served in and learning from the interactive displays of the veterans from each era. Uniquely both a memorial and a museum, it hosts special events, has an innovative Ribbons Display and a Great Hall. There is also an area to Honor the Fallen and share their stories in an educational way creating connections to these heroes. Video vignettes and green space combine for a layout that is truly a new national treasure and available to us here locally through the vision of leaders like Senator John Glenn and Congressman Steve Stivers, our Columbus Foundation and our military and city leaders. With the 6th largest veterans’ population in the US and such terrific reviews from our fellow Rotarians Tom, Dwight and Kent, we are expecting great use and visits to the National Veterans Memorial and Museum. Dublin's own Bob Fields (spouse to Dublin AM member, Ingrid Fields) provided a fascinating presentation on his vision for Fields Auto Works, a local start-up business that designs and builds cars for track driving. Bob explained that Track Day events are becoming increasingly popular for driving enthusiasts. With the direction of autonomous cars and smart roadways, it is expected that more and more track driving hobbyists will emerge. The clientele that Fields serves is the driving enthusiast who wants to hone their driving skills and be able to drive fast but not necessarily have interest in racing. We learned that to convert a street car into a track track ready car is very expensive. Fields' approach is to design the car from the chassis up and provide better vehicles at similar prices to those that are converted to track cars. Many of the components that his company uses are sourced locally. Bob also talked about the plentiful resources and expertise that are available to him and his associates in the Central Ohio area, from the Transportation Research Center to Ohio State, Battelle, Honda, TrueSports and Rahal. His aim is to get student apprentices and build interest in local vocational schools as well. There were many questions that followed Bob's presentation; clearly our club has quite a few car enthusiasts! Upcoming social activities to mark on your calendar include a Perfect Party on Nov. 10th, Holiday Party on Dec. 7th and Dublin Holiday Tree Lighting on Nov. 29th. Watch for upcoming emails on these events. Also watch for an upcoming email from Jim Burness about meetings scheduled for the Mission Trip that is planned for early Spring. The Jiffy Corn Muffin Mix collection continues on Nov. 2nd for the Thanksgiving Food Drive. World Polio Day raffle continues until Nov. 2nd. Please reference the email from Dwight and contact Dwight or Rich if you want to participate in the $125 Club. City Barbeque's Columbus Area stores are donating 25% of proceeds on Nov. 5th toward efforts to eradicate Polio. See the email from Dwight with the coupon. Former Ohio State QBs, Craig Krenzel and Justin Zwick were our guest speakers. This is an annual club favorite, and Craig and Justin did not disappoint. Their lighthearted storytelling from their playing days - in addition to insights into the current, confounding Buckeye Football team - kept the club members interested until after our regular scheduled end time. Unfortunately, they had no good answers or optimism to share about the recent challenges with this year's edition of the gridiron Bucks. 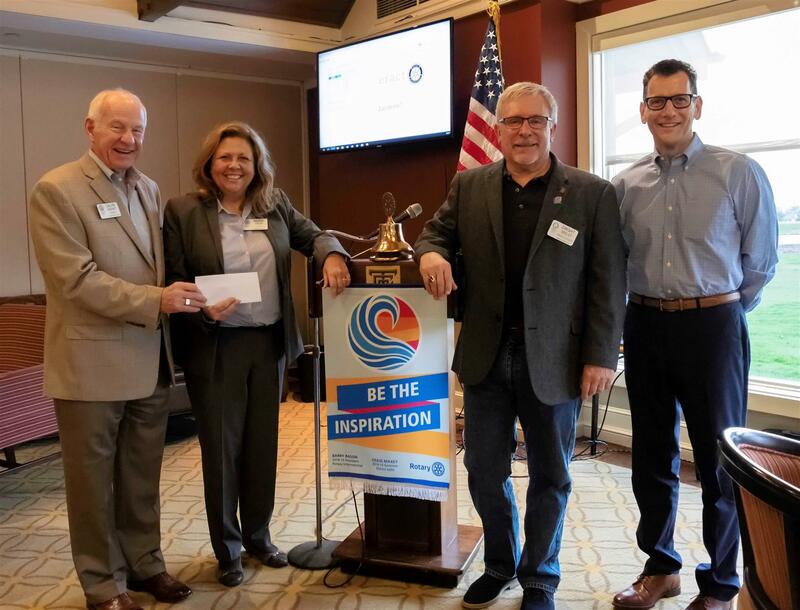 More important to our Rotary charter, Craig also provided an update on behalf of the 2nd and 7 Foundation which was founded by Ryan Miller who was traveling and unable to join us on Friday morning as he normally does. Founded in 1999, 2nd and 7 has football players in college and high school read to 2nd grade students and donate books - all of course to encourage literacy. Currently, 2nd and 7 operates in 26 states, with 47 colleges and university football teams participating in the program. More than 67,000 books have been donated, and the foundation has published its 13th original book. - Holiday Party is December 7th at 6:30 in our meeting room at TCC. - November 17th Perfect Party at Peter Georgiton's home - email to follow soon. - Dec. 1st and 15th Bell Ringing at the Bridge Street and Perimeter Kroger stores - Bill Andrews circulating the sign up sheet. - Dec 8th shopping @ Kohl's for the Salvation Army Christmas Drive - our club's annual family adoption will be funded by donations made at the Holiday Party and most likely at one of our Friday meetings - contact Susan Robenalt if you're interested in helping with the shopping. - Polar Bear sponsorships are needed. Contact Jim Bandeen - reminder to mark your calendar for Feb. 9th for the Polar Bear Open. - Dublin Scioto H.S. - 5th Annual Veterans Story Event is Thursday Nov. 8th - 3:30-6:00 - students, staff and community members will be honoring the service of over 225 veterans and military through musical performances, speeches and student presentations. - Jiffy Corn Muffin Mix Collection October 26th and November 2nd for the Thanksgiving food drive. - World Polio Day Challenge - watch for an email with details - collections at the meetings October 26th and November 2nd - we will have a raffle to win whiskey and all donations will contribute to the eradication of polio. Ryan Scribner, Economic Director of PPP, Pickaway Progress Partnership, of Pickaway County was our guest speaker Friday morning. He spoke of the strong manufacturing base in Pickaway County that become challenged over the past several years dating back to before the Great Recession; in Chillicothe, the town of 12,000 lost 3,000 jobs in a couple years. PPP is a public-private, non-profit partnership that is having success bringing in new manufacturing, logistics and other businesses with many new jobs. Dupont cited its reason for selecting Chillicothe as the lack of political headwinds it encountered because of the cooperation of the PPP. With $1billion in new investment and 2,500 new jobs and counting, Pickaway County is close to covering the job losses. In the Rickenbacker area, the warehousing and logistics growth is excellent. A big reason for the success that the PPP is having is due to its embrace of Regionalism, such as being active in Columbus 2020 and creating a joint economic development district with Columbus in the Rickenbacker area. Our guest today was Glenn Marzluf, CEO of Del-Co. Marzluf provided some interesting information about Del-Co, including; 1) It was founded in 1974 and includes 1800 miles of water pipeline in 7 counties covering 800 square miles, 2) Del-Co is a customer-owned cooperative that services 140,000 customers. The Duott Reservoir currently holds more than 3 billion gallons of water. What was more interesting was the history of water management that he provided us. Beginning with the Roman Empire's aqueduct system, water management and waste-water management has certainly evolved; however, today's systems use the same principles of pressure created by gravity. Our above-ground storage takes use the effects of gravity to create the water pressure in our homes and businesses. The New York City metro areas are served by aqueducts from up-state New York with the longest reaching 129 miles. In Chicago, pumps reserve 1 billion gallons of water daily from Lake Michigan to change the flow of the Chicago River. On Oct. 17th, the American Lung Association is hosting a Better Breathers Club gathering at the Crowne Plaza Hotel at 6PM in Metro Center. Cindy shared that persons with chronic lung diseases including CPOD, pulmonary fibrosis, Asthma and lung cancer should consider joining in this event to learn better breathing techniques using yoga. The 2019 Polar Bear Open is set for Saturday, Feb 29th. If you are able to assist in gathering sponsors, please reach out to Ingrid Fields or Susan Robenalt. Sinan is looking for students interested in being exchange students in the next school year. The international Rotary convention is scheduled for June in Hamburg. If you're interested, consider registering before the Dec. price increases. We provide a hand up, not a hand out through the Freedom Station, a place where veteran injured warriors go to receive housing, care, and assimilation to make the critical transition from military service to civilian life. Today’s Speaker Vic Tambone, Colonel, USAF (Ret.) is a member of the Board of Directors of the Warrior Foundation, a non-profit veteran help organization that established the Warrior Foundation Freedom Station. Wolf has requested more volunteers to help on Saturday set up or to judge the robotics competition on this Sunday September 30th in Worthington. Please reach out to Wolf if you can help with any set up on Saturday or to judge the competition on Sunday. Jack Curtis reminded the club tat we serve the Dublin Food Pantry the first Monday of every month from 5:30 to 7:30.All are welcome participants. Dave Williamson will send out the details and logistics once finalized for the Motts Military Museum tour by ur favorite tour guide and 911 Barn. On 10/24 we will honor the Rotary Polio Remediation progress and global impact. Dwight will share more as we get closer to that date. Today’s meeting hosted several guests to hear our keynote speaker, Vic Tambone, Colonel, USAF (Ret.). Vic shared the founding of the Warrior Foundation Freedom Center in San Diego and the passion and drive of the all-volunteer organization that we will pattern for the Freedom Station Ohio. Vic is a lifetime appointed board member of the Freedom Center San Diego and with his distinguished service in Washington DC to President Bush, Henry Kissinger and to our nation with his service.